Employee Appreciation Day comes on the first Friday in March. It’s a great time to honor employees for the work they do every day and thank them. At Medical, we’re always excited to celebrate our amazing team, so our leadership made sure this year was even more special. When Todd Brown founded 180 Medical, he wanted to create a company that would provide top-quality intermittent catheters and ostomy products while, above all, turning our customers’ lives around. 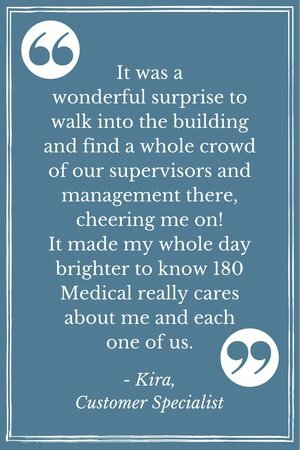 Todd’s vision for 180 Medical centered around staffing honorable, hard-working people who truly care about our customers. We wouldn’t be able to provide our brand of top-quality service without our staff of compassionate employees. That’s why we love to show our appreciation for them. This year, we all had a blast celebrating Employee Appreciation Day with a Spring Break Luau theme. Over the course of two days, 180 Medical had plenty of fun activities and surprises for our amazing employees. On Thursday morning, a full breakfast buffet waited for our employees in our brightly decorated break room. Employees enjoyed donuts, specialty coffee, and fresh pancakes that our managers and supervisors cooked and served fresh. The fun didn’t stop there. Plenty more surprises came over the course of two days, including an afternoon snack cart full of drinks and goodies, movies playing in the break rooms, and even a heartfelt cheer and greeting of all employees right at the front door. We’re proud of our employees because they display “the 180 Way” in all they do. 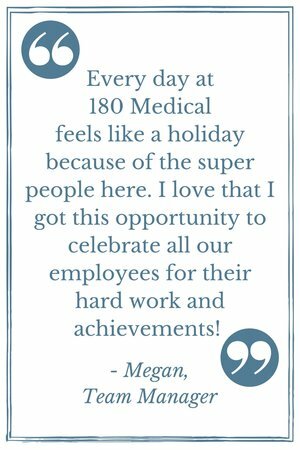 Thanks to them, 180 Medical is able to take care of each one of our customers just as we would do for a member of our own family. Being on the other side of Employee Appreciation Day this year as a supervisor is absolutely a one-of-a-kind experience. It gives us a chance to give back to our employees when they give so much every day. Our demonstrations of gratitude around Employee Appreciation Day is just a fraction of all they deserve for their hard work. I really hope we were able to brighten their day! After an astonishing 8 years of being named one of the Best Places to Work in Oklahoma, we believe we can say our employees really feel appreciated year-round. Are you looking for a job where you can make a difference and truly say you love what you do? We’re hiring! Check out our currently available positions, and find out more about 180 Medical at our Careers page.